Picture is © of Owen Smithers and is reproduced with permission of © Owen Smithers. Owen writes 'I must have been on shift with my dear friend George Hughes. Like myself a tear away so the shift a little friendlier than usual since we both enjoyed a joke. 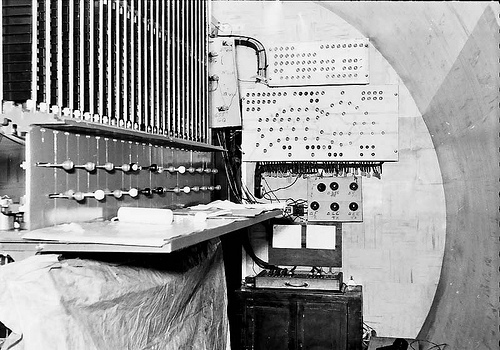 Owen writes 'It was difficult taking photographs in tunnel signal boxes due to the restrictions of movement. Standing with my back to the wall in the North Bound control area, this was the best I could do.The siding is signaled for two trains until Health & Safety interfered making it a single siding in the late 70's? The loop in an emergency will hold four 7 car trains nose to tail. In my time this has happened twice. The fullest extent of the SIDING reaches the Oval Station where there is a crew outlet from the Siding. Change Loop to Siding. 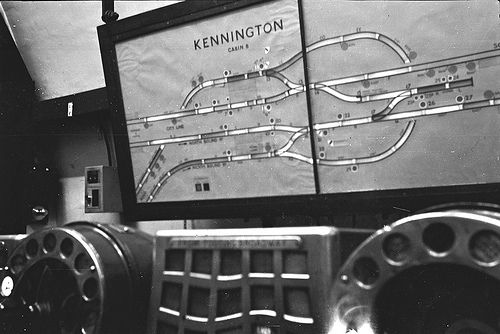 Kennington - Interlocking Machine Room 'V' style frame installation in 1956. 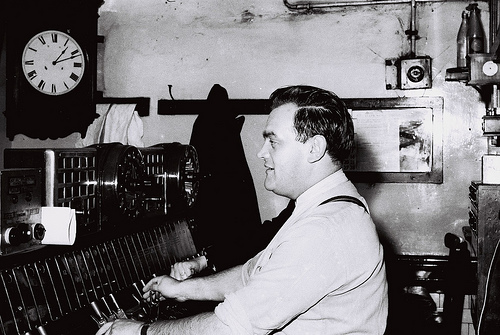 Owen writes 'Tucked away in the depths is Kennington's Machine room. This is where all the interlocking is now maintained. I had the experience once of having to run a service during a serious failure from here. Not having to operate interlocking on points previously, it suddenly became a real brain teaser. But after a few goes it remained in your head. 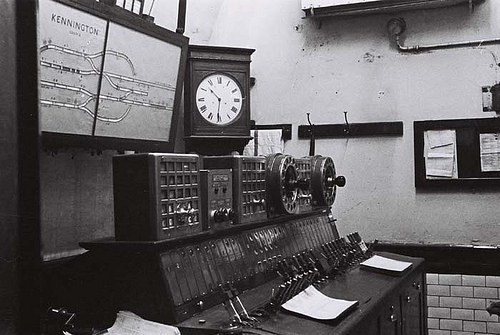 The signal box was closed and control was moved up the platform to a temp location on 22nd September 1957 so the signal box could be converted to an Interlocking Machine Room which had a 'V' style frame installed, (see last picture below) the Interlocking Machine Room was commissioned on the 26th January 1958 controlled from Leicester Square and then Coburg Street control room.